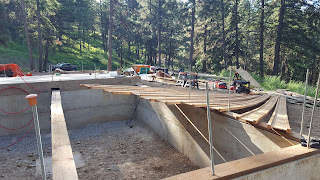 We are ready to string floor joists across the foundation, all we’re missing is a beam. 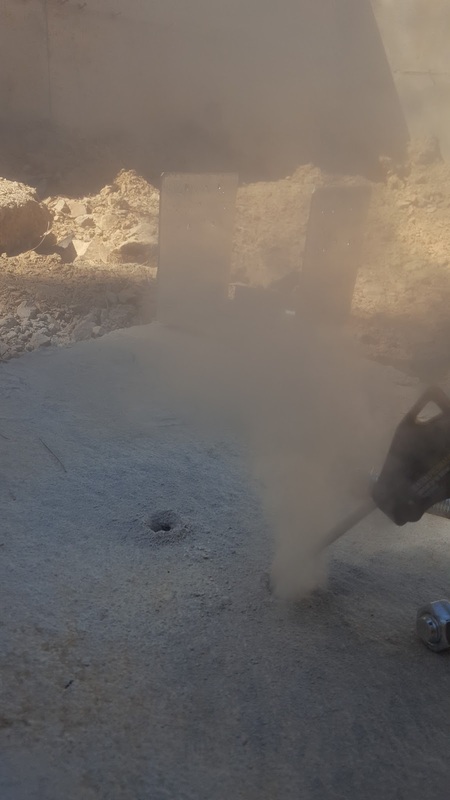 The mud sills provide a bearing and attachment surface for the ends of the i-joists. 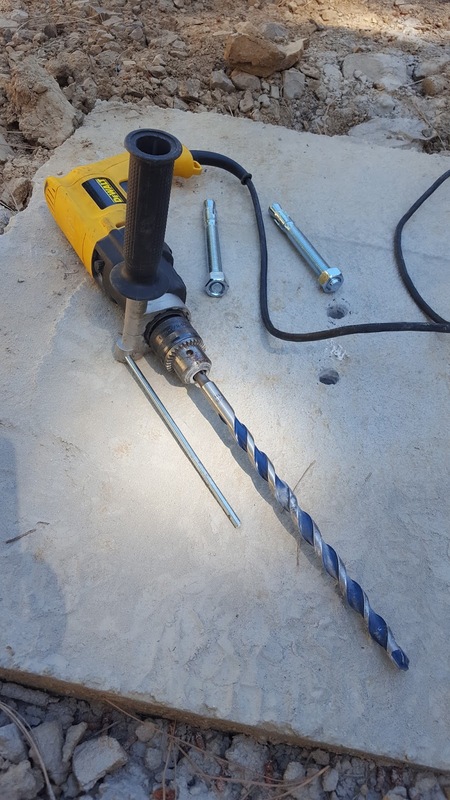 First we needed to install a floor beam in the crawlspace, running almost the full length of the house. The floor beam is made of the same 8 x 8 timbers we are building with. That meant tearing the tarps off the lumber stack and selecting the first pieces. They had to be straight and true, and the right length so we would minimize waste. 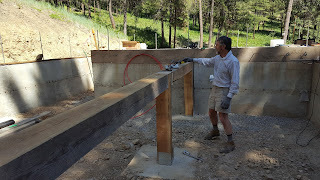 We found three nice timbers to use for the floor beam and the posts that hold it up. My friend Henryk came over for the weekend to help with this project. He pitched a tent in the backwoods here and camped out. We had dinner at Milepost 111 in Cashmere after work on Saturday. This was the first use of a cheap little jig I bought several years ago called the Beam Machine. 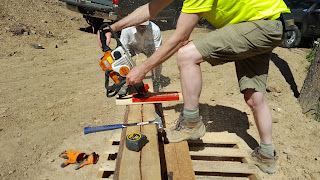 It’s intended to cut boards from logs, but we turned it 90° and used it as a cutoff saw attachment for a small chainsaw. 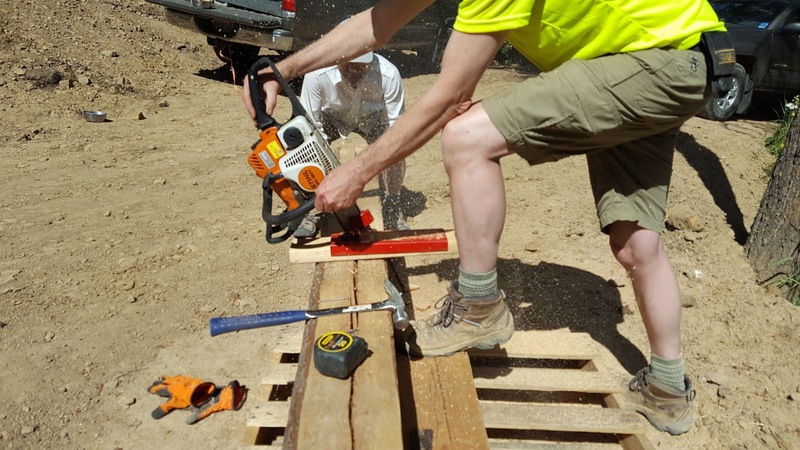 Even though this is chainsaw carpentry and we are working with big timbers, the floor beam called for accuracy and even cuts. Otherwise we might end up with a squeaky floor. There are four posts holding up this floor beam, and four concrete pads in the crawlspace to support them. I special ordered some steel post bases, which required drilling bolt anchor holes into those concrete pads. A small hammer drill with a long bit did the trick, and compressed air removed the concrete dust from the holes so the wedge anchors would fit. With considerable effort the two of us got all of these posts and beams into the crawlspace and nailed into their steel bases. With more grunting we managed to get the cross members mounted and level. The next step will be to lay joists across the opening and make fine adjustments so the joists are level too. 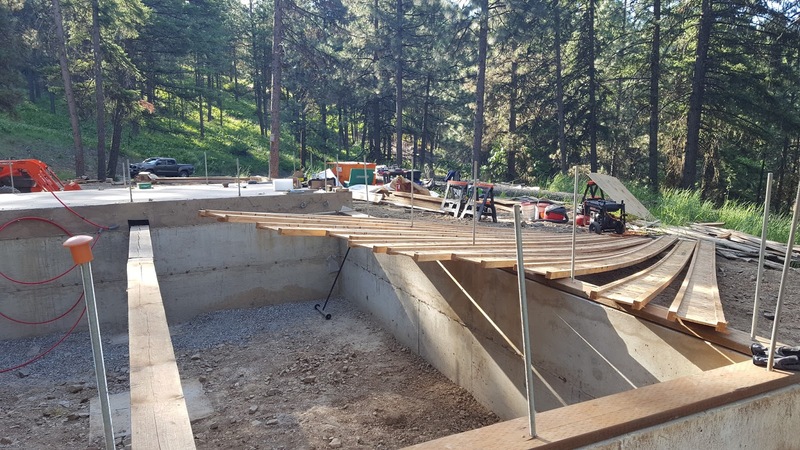 In the last photo you can see we’ve pulled the 22-foot joists up onto the wall, ready to pull them across and start that process.